Disclaimer: This was a complimentary media tasting. With lots of modern decor and furniture, the Spade interior is spacious and relaxing. My eyes were immediately drawn to the unique communal table staged in the center of the restaurant. Constructed with 120-year-old reclaimed cedar, the table made for the perfect flat-lay background. Since this was a Sammy Piccolo restaurant, we made sure to try at least one coffee drink even though I'm not much of a coffee person. 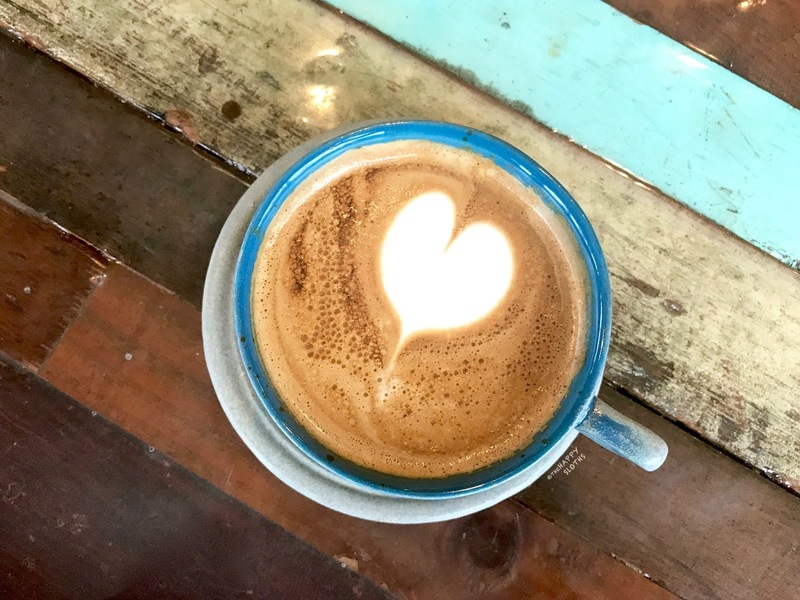 We ordered the Latte ($4.50) and it came in a beautiful little cup paired with a simple latte art. The taste was quite milky with a yummy nutty undertone. It's definitely a good pick if you don't want anything too strong. 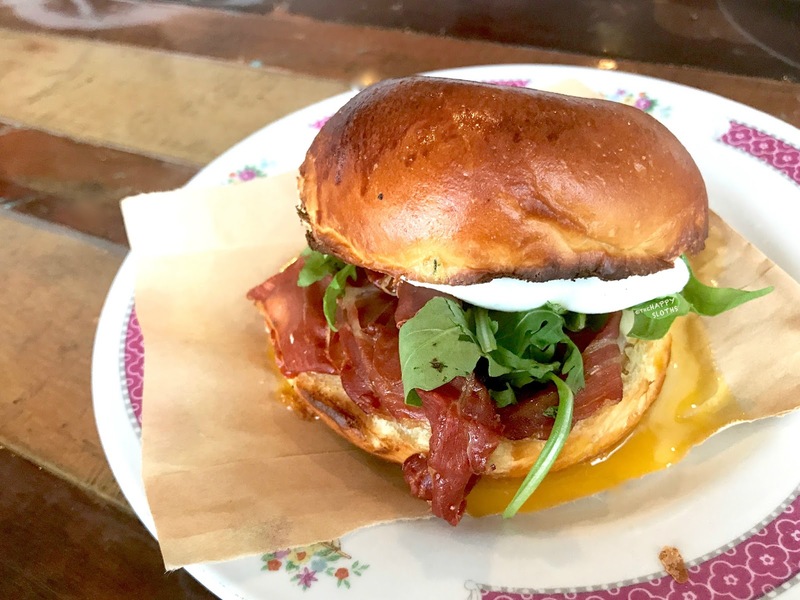 We ordered off the brunch menu and started with the Meat Breakfast Sammy ($8.50), which is a breakfast sandwich consisting of ham, cheddar, basil mayo, onion jam, mixed greens, and soft poached egg on a buttery brioche bun. Although we dined in, the sandwich came in a brown paper bag rested on top of a plate. The presentation is certainly unique and hip but it's also highly impractical as when I took a peek inside the bag, I discovered that the egg yolk had already burst, presumably from the kitchen's effort of stuffing the hefty sandwich into the bag. Aside from the burst yolk, the sandwich tasted pretty yummy. The prosciutto-like ham was perfectly salty and the brioche bun was very satisfying. The star dish, without a doubt, was the Eggs in Purgatory ($10). 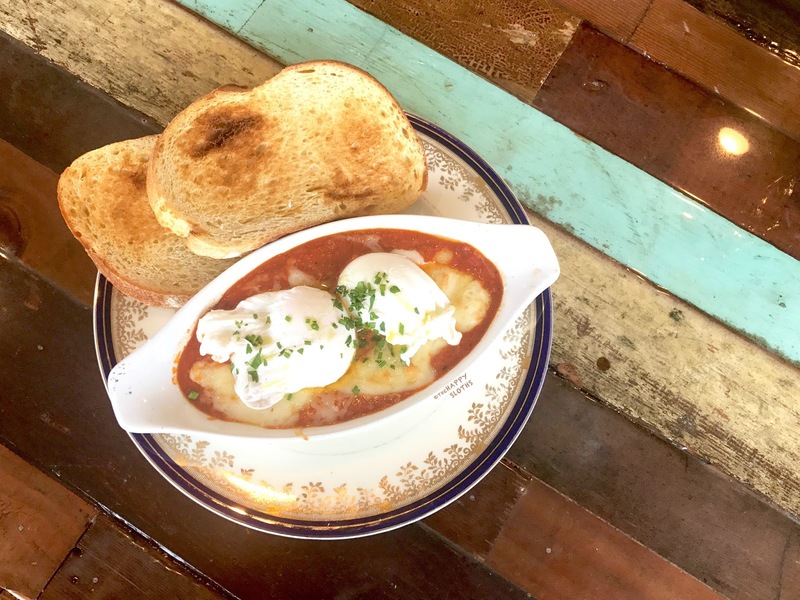 Served with a warm and lightly spicy chilli tomato sauce topped with some yummy melted cheese, this poached egg dish comes with a side of toasted sourdough bread. The tomato sauce is beautifully seasoned and the eggs are nice and oozy. With the two hefty slices of sourdough, this made for the perfect Sunday brunch. Not much can be said about the service since brunch was semi cafeteria-styled. We ordered at the counter and the items were brought out by the staff. Water and glasses can be retrieved near the register and we bussed our own table as that seemed to be what everyone else was doing. 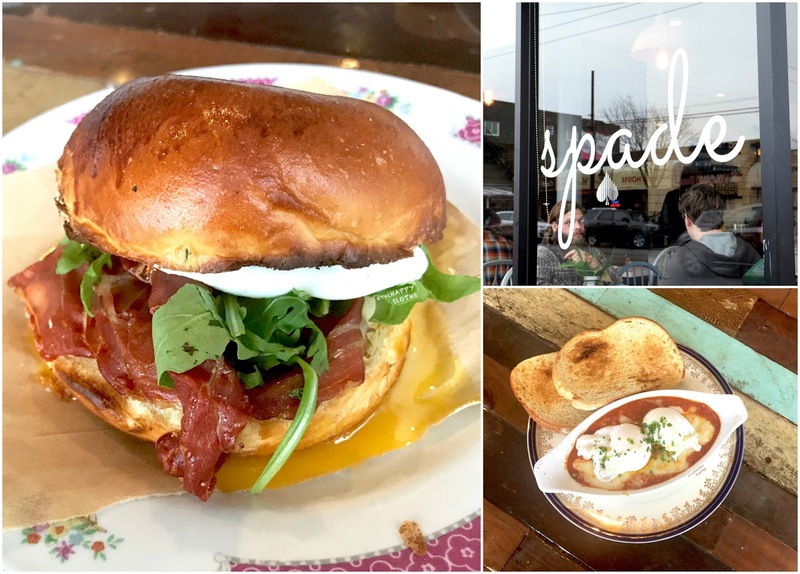 If you are in the mood for some homey and affordable brunch, definitely check out Spade the next time you are on Commercial Drive! Eggs in Purgatory would be my recommended dish but the Meat Breakfast Sammy is worth a try as well! 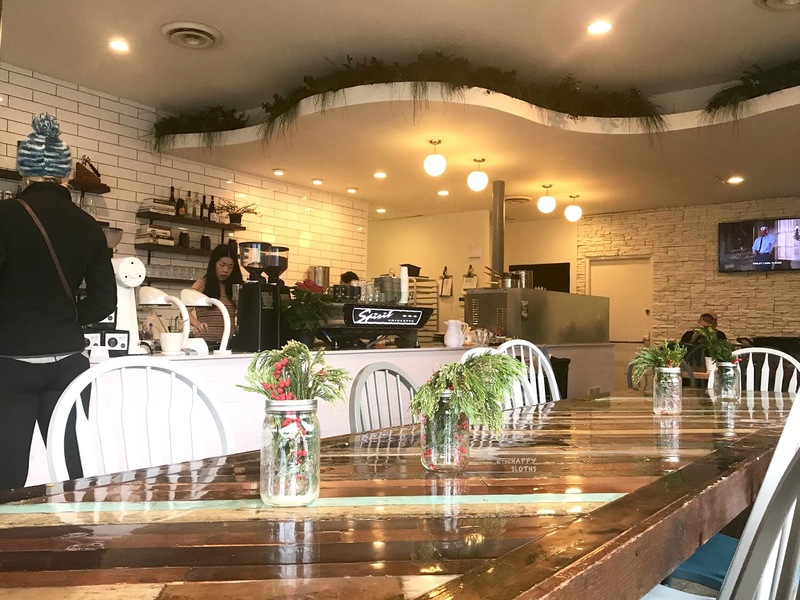 Spade is a cafe-restaurant located at 1858 Commercial Drive. To learn more, visit www.spadecoffee.ca.